Bolsheokhtinsky Bridge connects the left bank of the Neva, the historical center of St. Petersburg (along the Tulskaya Street) with the old Okhta district. It is thrown from Smolnaya and Sinopskaya embankments to Sverdlovskaya embankment on Malaya Okhta. Bolsheokhtinsky Bridge is 335 meters long and 23.5 meters wide. All the sorrows we realized. The folk love for Little Okhta was expressed in the proverb: "Little Okhta - Big love". In 1829, during the elaboration of development plan of St. Petersburg, Nicholas I denoted the need to build a ferry from the center of St. Petersburg to the working Okhta. Because of the lack of funds, the solution of this problem was postponed and the issue was raised again only in the 1860s. It was decided to connect the Okhta with St. Petersburg not only by the ferry, but also administratively. There were disputes over the location of the bridge, because everyone wanted him to be built next to his company, and boatmen and ferrymen did not want to lose their job and by all available measures prevented the start of building process. And only on June 5, 1884, the City Council decided to build a bridge from the Smolny Cathedral to the Krejton shipyard, in the area of ​​the old Petrozavod, so it was said "To recognize the Okhtin suburb, which had to be annexed to the city of St. Petersburg". On September 1, 1901, an international contest for the ferry project was announced. The 16 presented projects were rejected because of their non-compliance with the technical decisions and the building of the bridge was postponed. Only after the tragic event, when in the spring of 1907 Arkhangelsk ship sunk down during the crossing of Okhta and people died, the ruler ordered not to delay the building of the ferry. Then among 4 presented non-competitive works the project "Freedom for navigation" was selected, executed by Professor of Nikolaev Engineering Academy, colonel G.G. Krivoshein and military engineer Lt. Col. V.P.Apyshkov. The building of the ferry base took place on June 26, 1909, on the eve of the 200th anniversary of the Battle of Poltava, whose triumphant was Peter the Great, so the bridge was named after the emperor Peter the Great. The ferry was built quickly and was opened on October 26, 1911. The project was led by its author G.G.Krivoshein, the dividing spree and the raising mechanism were completed by the St. Petersburg’s metal plant, and the Warsaw Construction Company was the builder. The bridge has 3 spans and two side spans of 136 meters in length with giant metal arches in the form of roofs create such originality for the bridge. These spans were unique for Russia and Europe. The central span has a length of 48 meters, its wings are bred vertically and move around the fixed horizontal axes. Although the idea of ​​a raising upward span was first expressed and substantiated by Academician A.I.Dmitriev, it was realized in the reality by the author of the project G.G.Krivoshein. The raising mechanisms could lift the wings of the bridge in just 30 seconds. The built bridge differed greatly from Liteiny and Troitsky. It had only 3 spans and the middle one was decorated with high granite towers – lighthouses with lanterns in the shape of cubes, to which adjoined small towers reminding medieval fortress towers. The bridge supports and descend to the water at the left bank support are covered with granite.On granite towers are installed the marble boards with the names of builders who created this masterpiece. 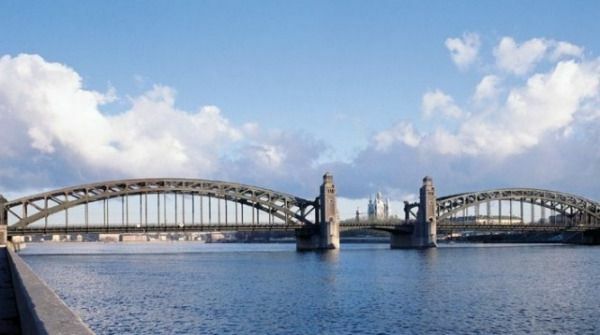 After the revolution, the bridge was renamed "Bolshekohtensky", and in 1954, according to the rules of spelling, it became known as "Bolsheokhtinsky". In the 1990s, the bridge was reconstructed; the diving span and lifting mechanisms were rechanged.In 1997, the bridge was opened, and after the installation of the artistic backlighting in 2000, when more than 1300 lamps with a power of 1000 watts were installed, it began to look fabulous. Like the Eiffel Tower, the Bolsheokhtinsky Bridge is built of riveted constructions - metal constructions whose elements are joined by rivets. Contemporaries called the crossing an ugly and cumbersome and cursed it just like the Parisians - the Eiffel Tower. And now the Eiffel Tower is a symbol of France, and Bolsheokhtinsky Bridge is considered as one of the most beautiful in the world. This grandiose building with a weight of 9,000 tons of metal has 335 meters in length. For comparison: the Eiffel Tower, together with the antenna, has a height of 324 m, the weight of the metal constructions is 7 300 tons, and the total weight is 10,100 tons. Immediately after the building of the ferry across the city, there were gossips that one of more than a million rivets of the bridge is gold. The builders put a gold rivet for happiness, covering it with a metal slick, which greatly complicated the searches. As the curious Petersburgers did not try, they did not found a gold rivet. As it's impossible to verify this legend, let's consider it as a truth. 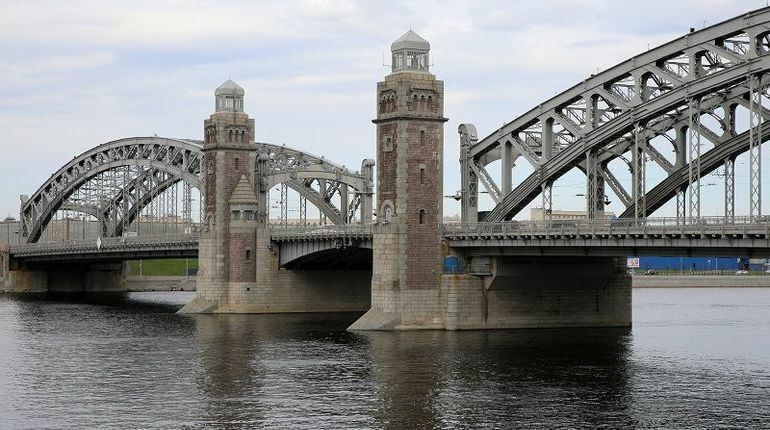 For over 100 years, the Bolsheokhtinsky Bridge is a transit highway of St. Petersburg and one of the attractions of the Northern capital, inseparable from its appearance.